A really sweet set of countertop drawers of with bird’s eye maple drawer fronts, all with an original red stain. 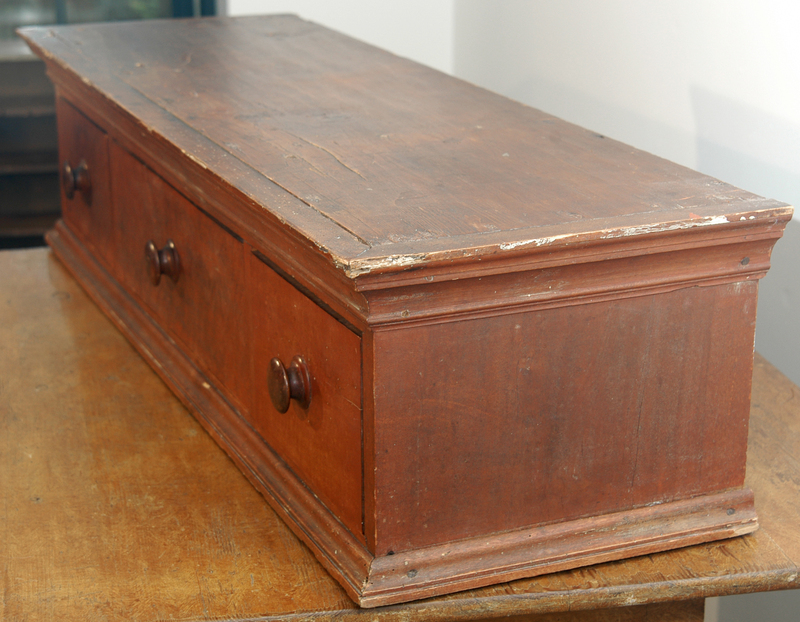 This set of drawers with of pine construction except for the maple drawer fronts and the hardwood moulding was probably from a store as it has the big drawers on the front as well as smaller drawers on the unfinished back which would allow the merchant to have things out of reach of customers. 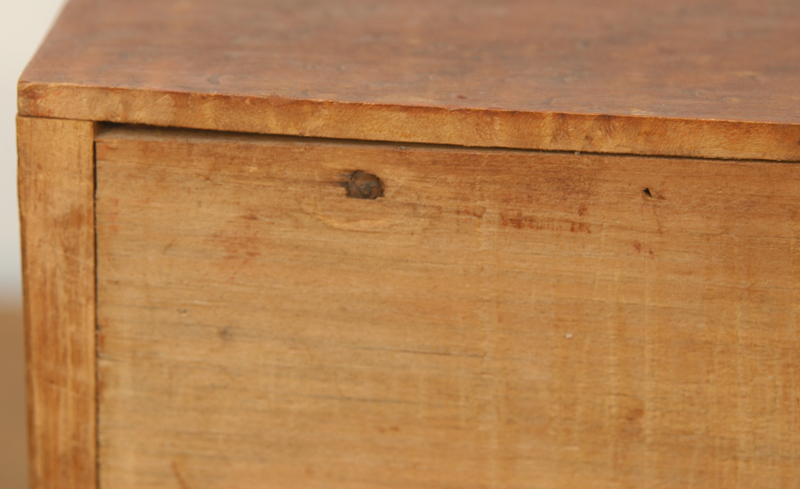 The drawers are all dovetailed front and back with square nails on the bottom of the drawers. 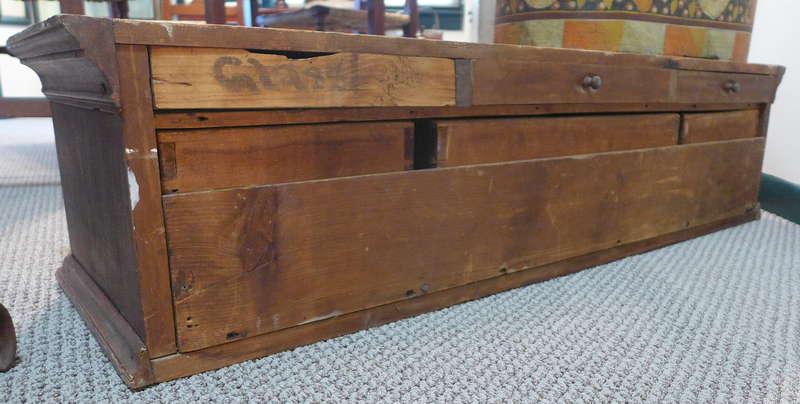 The case is mortise and tenon at the drawer frames and may be nailed at the top although the nails are filled with staining so I can’t tell. 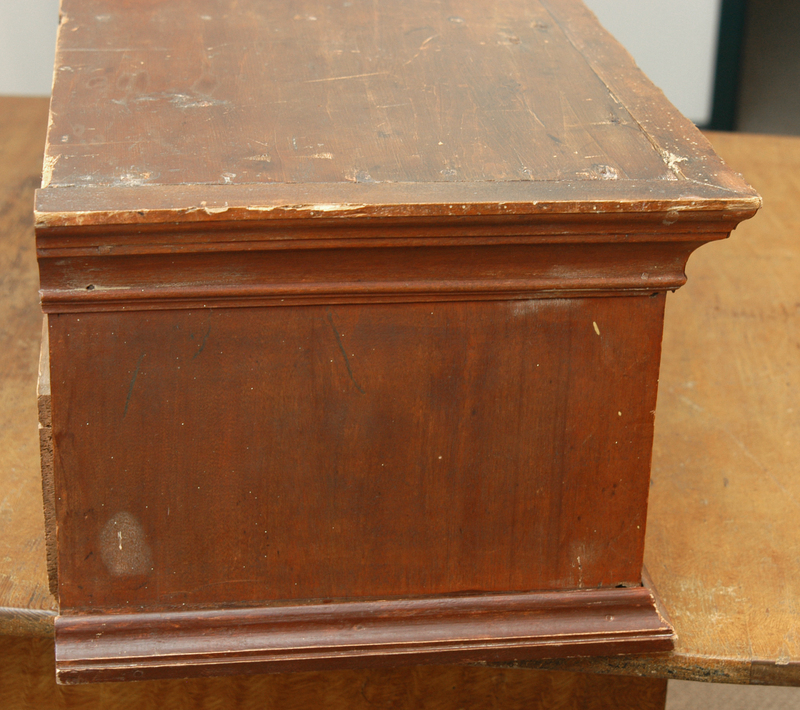 There are square nails on the bottom of the case and holding the moulding. The bottom stick of moulding on the left side of the case appears to be replaced but is very nicely matched. 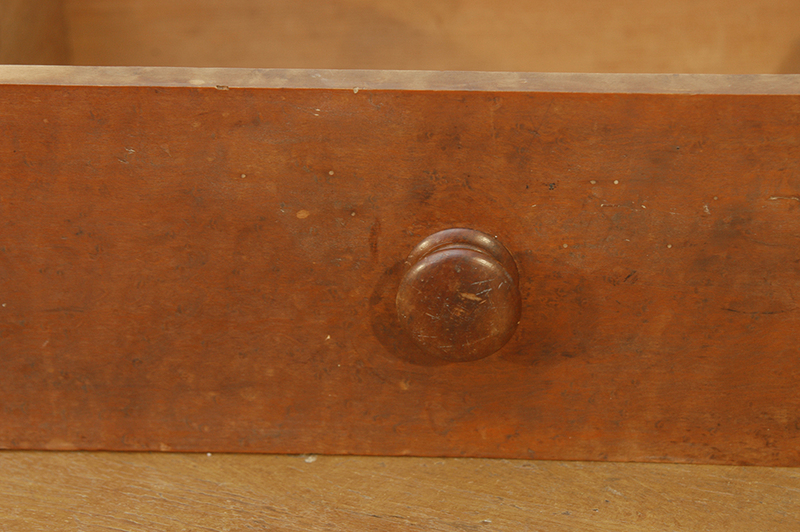 The back drawers have fun thin wood knobs set into recessed coves. However, the knobs still extend beyond the back panel which prevents the set of drawers from being hung on the wall. 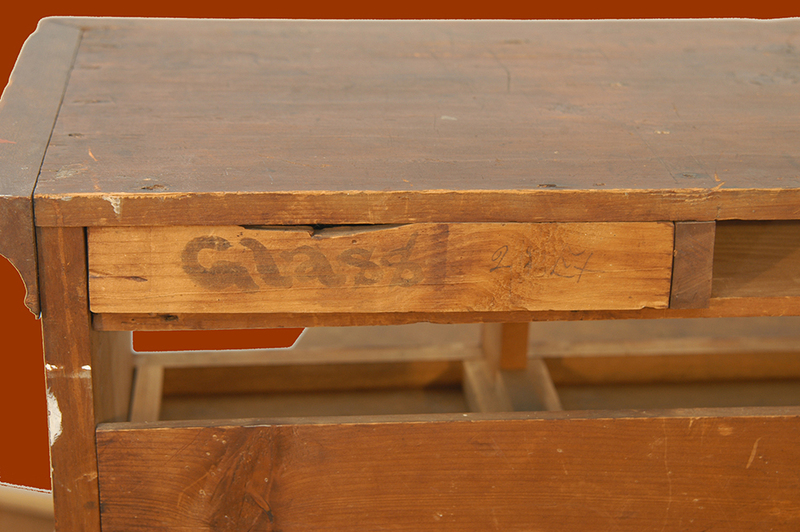 One of the back drawers has been replaced by a board covering that has the word “Glass” painted on it. I’m guessing the drawer was broken or perhaps lost. There is age to the wood covering but it does not appear to be quite as old as the rest of the wood. 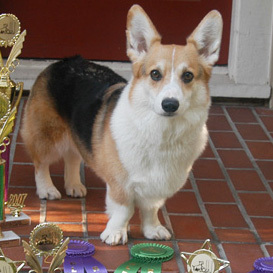 As you can see in the photos, there are expected scrapes and bumps. There are some white paint drips that you can see in the photos. 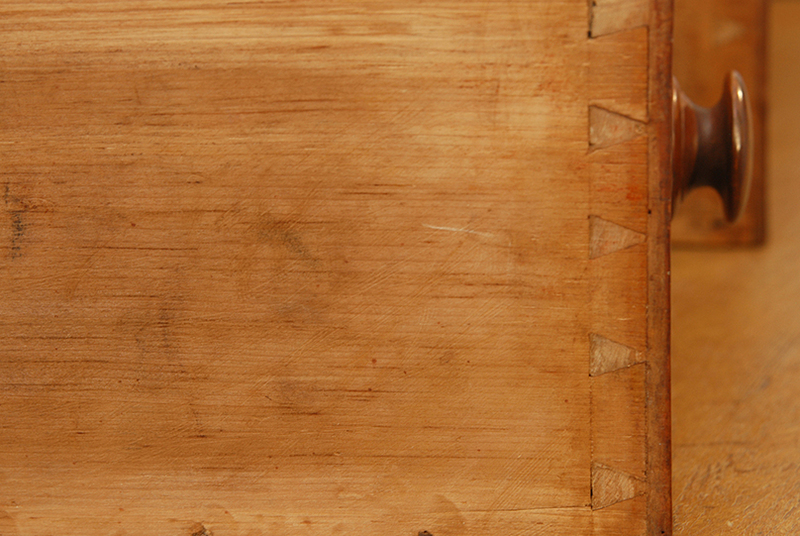 In canting light you can see the great hand-planing on the top board. 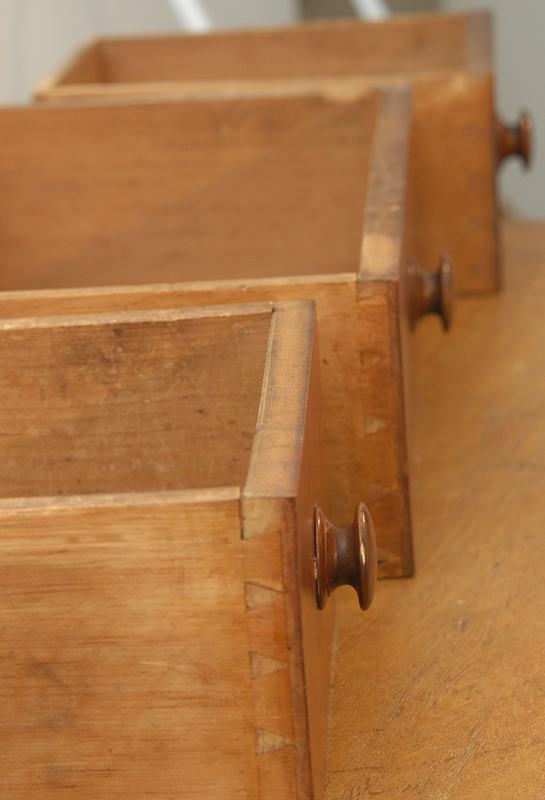 It’s a really sweet set of drawers and would be really great on a kitchen counter. The piece is 41 ½” long x 10 ½” tall x 13 ½” deep. 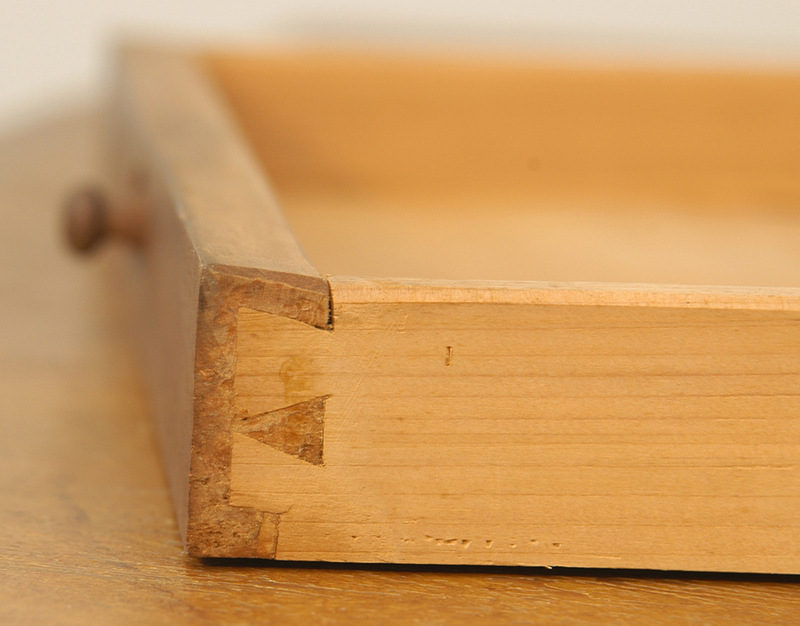 The knobs on the back drawers cause the piece to require a space at least 14 ½” deep. In my usual completeness I’ve loaded up way to many photos and I have more that I can send if you like….details like nails, inner construction, etc. Shipping will require professional packaging which will be at the expense of the buyer in addition to the shipping expense. Circa 1850.